Have you tried fat bombs yet? 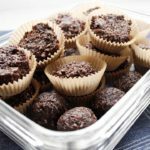 These Raw Coconut Carob Treats are fast to make and great for snacking or as a dessert. If you can’t eat chocolate (or raw cacao), these treats are the best alternative to mini chocolates and are good for you! Blend all the ingredients in a medium bowl, by hand, until everything is well combined*. Transfer and divide the coconut mixture to 12 cup mini muffin pan**. Enjoy one, or two, as an afternoon snack or as a treat after a meal! * Tip 1: If you have a small blender or food processor, you can use it to help you blend the mixture. Leaving bits of coconut is great, so don’t worry about blending it smooth. ** Tip 2: Using unbleached parchment mini muffin liners is great, as the mixture won’t stick to the paper. The liners are optional as it will work fine without them. You don’t have a mini muffin pan? Try using an ice cube tray! You can also roll the mixture into 12 round bites. Tip 3: Store these in the refrigerator for up to 2 weeks. The Raw Coconut Carob Treats might melt if left in a warm environment. Best enjoyed straight out of the fridge!